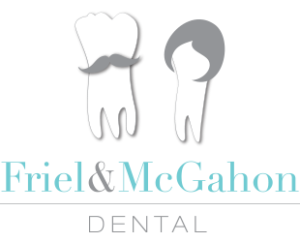 Cosmetic Dentistry is offered at Friel and McGahon. Stained or unattractive teeth can have a great impact on someone’s psychological well-being. We understand how important it is to feel good about the way you look. Our cosmetic dentistry services make it possible to maintain a youthful appearance and give you a naturally beautiful smile. Veneers are thin porcelain facings used to disguise minor problems of tooth position, shape or colour. This commonly involves a small amount of tooth preparation. After fitting, porcelain veneers look their best for between 10-15 years with good maintenance. It may also be possible to place a composite resin veneer if the tooth/teeth in question are well aligned but need a change in shape. This has the advantage of being added chairside, directly to the teeth, often with no tooth preparation at all. The look their best for 5-7 years. This can often be fixed conservatively by adding some tooth coloured composite material appropriately shaped to close the gap. If the spaces are larger, we can use porcelain veneers to give a durable result. At Friel and Mc gahon Dental we provide a home bleaching system. We feel this is the best type of bleaching system as it is controlled by yourself so you can get your teeth to the whiteness and brightness that you like best . We also find it to be the longest lasting, result in the least sensitivity and the beauty of it is that you can top it up in the future by buying refills.